Rosita Extra-Virgin Cod Liver Oil (EVCLO) is produced in small batches from Wild Cod (Gadus morhua) and sustainably harvested from the Pristine Waters of Norway. A rare and exclusive cold-process Artisan method extracts the oil and preserves the delicate nutrients naturally present in Wild Cod Livers. The resultant oil is as pure and authentic as it was for our Nordic ancestors hundreds of years ago. Adults take three softgels (500mg each) twice daily. Keep at room temperature (15°C – 25°C). 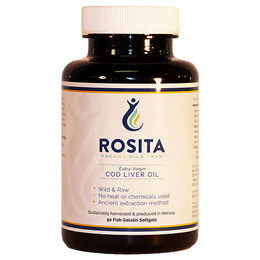 Below are reviews of Rosita Real Foods Cod Liver Oil - 90 Softgels by bodykind customers. If you have tried this product we'd love to hear what you think so please leave a review. Good size. Easy to swallow. Rosita Extra-Virgin Cod Liver Oil (EVCLO) is produced in small batches from Wild Cod (Gadus morhua). Sustainably harvested from the Pristine Waters of Norway.